In the world of innovation, not all inventions are created equal. While beauty lies in the eye of the beholder, many would say that green energy inventions have a reputation for being ugly. But clean energy doesn’t have to be ugly, and architects and inventors have created stylish eco-friendly structures that are as beautiful as they are clean. Standing at 7 meters tall, this smog-eating tower can clean enough air to fill one football stadium each day. Located in Beijing, the structure is the largest smog vacuum cleaner in the world. It works by creating a “bubble” of air that is 40% to 70% cleaner than the air around the rest of the city. A similar vacuum is located in Rotterdam. From the creator of the smog-eating towers, these rings are the tower’s other by-product. Dutch artist and architect Daan Roosegaarde discovered a way to compress smog into rings, and claims that by purchasing one ring a person donates 1,300 square meters of clean air. 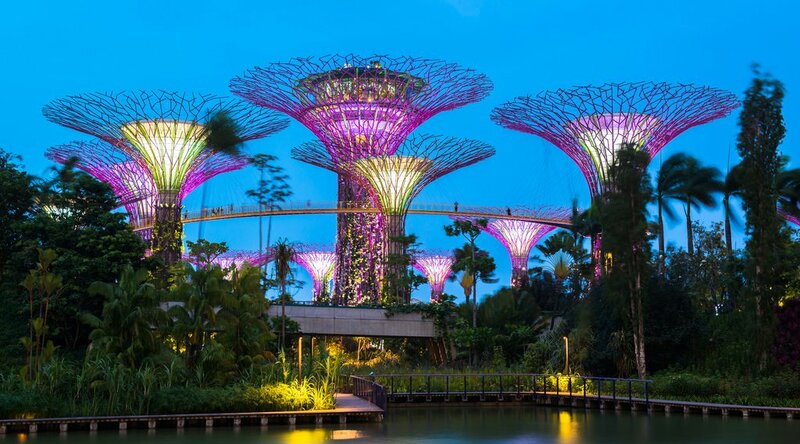 Rooted on Singapore’s Gardens by the Bay, these 18 man-made trees stand at tall as 50 meters high and catch the eyes of anyone who visits the city’s waterfront. They deliver a three-fold effect to the environment: generating solar power, collecting rainwater and working as air ducts for local flora and fauna. 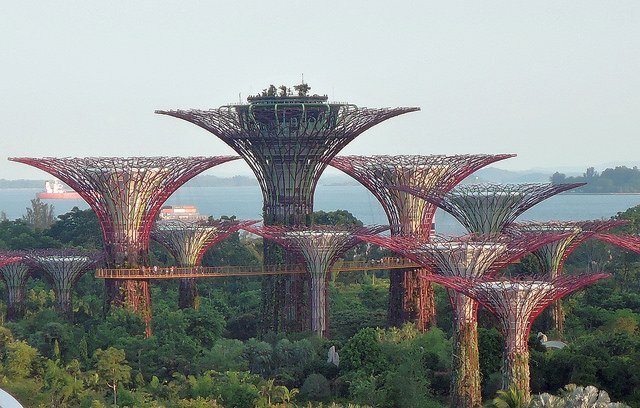 This magical-looking city could be out of a scene from a movie set in another world. Yet, construction on two towers called the Nanjing Green Towers is currently underway in China’s eastern city, and could be complete as early as 2018. Together, the towers will hold 1,100 trees and 2,500 shrubs, which cascade from their balconies and rooves. A similar structure exists in Milan, Italy, where construction on the “Bosco Verticale” finished in 2014. Unlike Milan, China is looking to expand the forest city effect throughout Nanjing and to build similar towers in Liuzhou and Shijiazhuang. Not only is this skyscraper stunningly beautiful, it also “brings the green revolution to the poorest people” and can modernize agriculture in developing African countries. The design for Mashambas Skyscraper won the 2017 eVolo skyscraper competition for its innovative design. Once built, the structure will work as an agricultural center, educational center and marketplace for communities in Sub-Saharan Africa. Visitors to this region of Norway come for its beautiful nature. Instead of sticking out like a drab piece of concrete in an otherwise untouched forest, this hydropower plant blends in with its beautiful surroundings. The architecture firm that designed the structure said they intended for the outside of the plant to mimic the spruce trees in the area; they also incorporated local wood into the design. The panda is the new face of solar farms in Asia. Using light and dark solar panels like mosaic pieces, companies are building solar energy farms in the shape of cartoon pandas. China has already built one in its northern region, the first of 100 the country aims to build, and construction is underway on a second. The two renewable energy farms can together prevent 1.06 million tons of coal from being burned and 2.75 million tons of greenhouse gas from being emitted in the next 25 years. Fiji also announced that it will build a panda-like solar farm. Although simpler in design than China’s panda-shaped solar farm, this solar field in Orlando features another much-beloved animal. Powered by Duke Energy, the 22-acre solar field is shaped as the head of Mickey Mouse. The solar-powered system is part of Duke Energy’s effort to increase solar energy sources in Florida, and generates as much power as nearly 1,000 rooftop solar systems. These large, modern palm trees are so much more than a stylish solar panel. Bent like a palm tree and complete with a bench, the structures were designed for pedestrians to take a rest in the shade and charge their phones while they’re at it. Dubai installed its first Smart Palm in Zabeel Park 2015 and is currently working to install 100 more. The design of the Smart Palms is symbolically important to the people of Dubai. Historically harvested for food and material, the tree is now a symbol of sustainability in the city.